-Non-Adhesive Static recommended for High Gloss Finishes. -Clean the instrument surface to be free of any dust or build up. If you have a support (any manufacturer) which looses suction and comes off, this is your solution. Do I need to put it on each time I play? NO. Put it on once and leave it on. It will not damage your finish. By creating an ideal smooth surface for the cups, free of dings, pits and scratches. 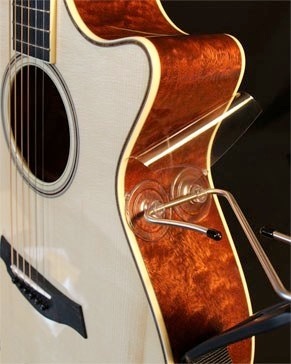 For use with ALL guitar supports! 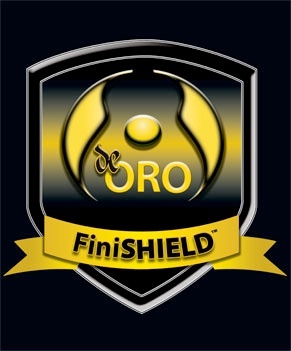 “The FiniSHIELD was the solution to my problem! I am now enjoying playing with the Guitarest Trio, and proper support for the guitar. 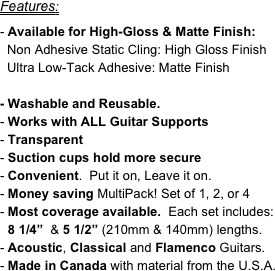 NEW LOW-TACK ADHESIVE VERION NOW AVAILABLE FOR MATTE FINISH GUITARS!